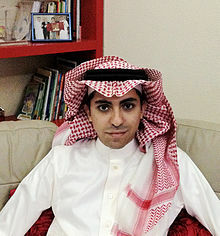 Raif Badawi (Arabic: رائف بدوي‎, an aa transcrived Raef Badawi; born 13 Januar 1984) is a Saudi writer, dissident an activist, as well as the creautor o the wabsteid Free Saudi Liberals. ↑ PEN International/IFEX (11 January 2013). "Prominent Saudi writer's safety at risk after arrest". The Arabic Network for Human Rights Information. Retrieved 20 January 2013. ↑ "Saudi Arabia: Website Editor Facing Death Penalty". Human Rights Watch. 22 December 2012. This page wis last eeditit on 12 Dizember 2018, at 07:32.